A Pathfinder Roleplaying Game Compatible GM's Resource by Ben Armitage, Alexander Augunas, Aaron Bailey, John Bennett, Creighton Broadhurst, Jeff Erwin, James Graham, Brian Gregory, Eric Hindley, Ben Kent, Thomas King, Greg Marks, Andrew J. Martin, Jacob W. Michaels, Julian Neale, Chad Perrin, David Posener, Brian Ratcliff, Pierre van Rooden, Liz Smith, Josh Vogt and Mike Welham. Then GM’s Miscellany: Dungeon Dressing is for you! This gigantic compilations comprises all 34 instalments in the line as well as scores of riddles, new material and design essays by Creighton. GM’s Miscellany: Dungeon Dressing presents loads of great features to add to your dungeon. 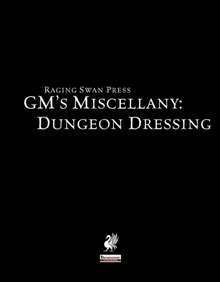 Designed to be used both during preparation or actual play, GM’s Miscellany: Dungeon Dressing is an invaluable addition to any GM's armoury! All That Glimmer: Also includes as a free special bonus are treasures hoards 1-20 from All That Glimmers - after all, what’s a dungeon without treasure! Thanks for spotting this. I've fixed the problem myself. It seems when I increased the number of pages available to the preview it messed up the sale price setting. Again--thanks very much! Why is this book listed as a scanned page book (hardback only? print only?)? In this day and age, that process seems archaic to say the least. I was all set to pull the trigger on a print+pdf bundle of this book, until I was that 'scanned page' notation on my order. Hi Jon. I'm not sure why it is listed as a scanned book. I can absolutely guarantee that the book was prepared from a PDF uploaded by my good self! Thanks, Creighton. I appreciate the follow-up. I think I bought the pdf already, so I'll take another look at the pdf and make a judgement call whether I should order the print version. Thank you very much again for the great offer, Creighton. My pleasure, Tom. I'm glad you enjoyed it! The included materials list should include "Dungeon Dressing: Dungeon Entrances" as a source. Thank you for pointing this out. I'll add it now. Hey, if I'm running d&d 5e would I be better off with system neutral edition, or just doing spot conversions from the Pathfinder edition? Personally, I'd got with the Pathfinder version. Most of the changes you'd need to make would just be DCs and suchlike. If you grab the Pathfinder PDF version and discover it's not for you, just let me know and I'll send you the System Neutral PDF free of charge. My contact details can be found on the Raging Swan website. It would seem this is the only, available, method to contact you. Let me begin by saying I have gone through great lengths on both the "Raging Swan Press" site and this seller page collecting any possible scraps of your material I could. I love every bit of what I read in your books that Id rather have to sort out potential duplicated material than risk missing something. Admittedly I have made PDF printout of all blog posts as well as downloaded any free resources listed within the blog and all free materials listed here as well. Your work is invaluable in so many regards. I know how the opportunity to make some purchases and am eager to do so, however, I have one cause for hesitation. I do not use Pathfinder, nor even it's predecessor, I run my system under the 5th edition rules from WotC. Are there system agnostic titles that are purely fluff? Much of what I have already seen leads me to believe that the "Backdrop", "Dungeon Dressing", "Miscellany", "All that Glimmers"...See more and the like are primarily fluff and usable for any system that will allow the DM to fill in the cunchy bits as needed. Could you confirm this or provide a list of materials that I won't have to convert to meet my needs? Again thank you so much for so many incredible products, I eagerly await your reply. Thanks for the question and the kind words! Most of our books--with the exception of adventures, Scions of Evil and the 100% Crunch line--are quite crunch light so they should work fine with 5e. For example, most entries in the Village Backdrop line have at most two stat blocks. We have just released a System Neutral version of GM's Miscellany: Dungeon Dressing (available at RPGNow and DriveThruRPG) and are releasing a System Neutral version of GM's Miscellany: Wilderness Dressing at the end of the month. Both of these should be fine for use with 5e as long as you don't mind setting your own DCs and so on. If you've got any more questions, check out the sidebar on our website. It's got an handy email link there which drops straight into my inbox. Thanks again--good luck with the campaign! I have given the book a fairly solid skimming and I am really looking forward to using it on my next dungeon(which will also be my first real dungeon) and feel pretty good about ordering the pdf/softcover bundle. My only real complaint I have found is in the riddle section. I am not a huge fan of having the answers placed so close to the riddle. While I understand that the book is meant as a DM tool it still makes sense at least to me to have the answers on another page. It is hard to judge the quality of the riddle if you yourself can not mull it over in your mind. Perhaps others have greater self control but I found it near impossible to not see the answer out of the corner of my eye while reading the riddle. Anyway thank you. Thanks very much for the kind comment, Adam. I'm glad you enjoyed the book, and I'm sorry the riddle section didn't work 100% for you. Hopefully, you'll still be able to use them in game!